Sensodyne joins hands with The Times of India in its country wide initiative to raise awareness about teeth sensitivity and to inspire people to lead a sensitivity-free life It is a common problem that impacts 1 out of 3 adults in India. Tooth Sensitivity is a short, sharp sensation experienced in the teeth on eating something hot, cold, sweet or sour. People miss out on their favorite foods and drinks to avoid this problem. 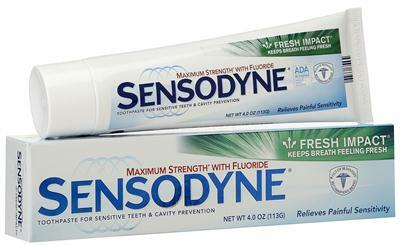 A simple solution is to change to a disensitizing toothpaste. 1) Do you feel a short, sharp sensation in your teeth when you consume something hot, cold, sweet or sour? 2) Are the sensations you feel, only in certain teeth (as opposed, to many) ? 3) Do you think 'hard aggressive brushing' is a good description of your brushing technique? 4) Do you find yourself avoiding certain foods and drinks in order to avoid the sensation (for example ice cream)? 5) have you managed your eating and/or drinking habits to help prevent the sensation (for example drinking a straw or waiting for hot drinks to cool down)?